Trust is important in any project, but especially for a major financial institution. That’s why a national bank turned to Electrical Alliance contractor, Cabling Systems, Inc. of Beltsville, Md., to rewire existing bank branches and perform complete renovation projects, including placing desktop computers and phones and installing new network switches, servers, routers, uninterruptible power supplies (UPS) and wireless controllers. “We do a lot in the ever-changing world of telecom,” said John Narron, Registered Communications Distribution Designer (RCDD) and president of Cabling Systems, Inc., which specializes in low voltage cabling installations. 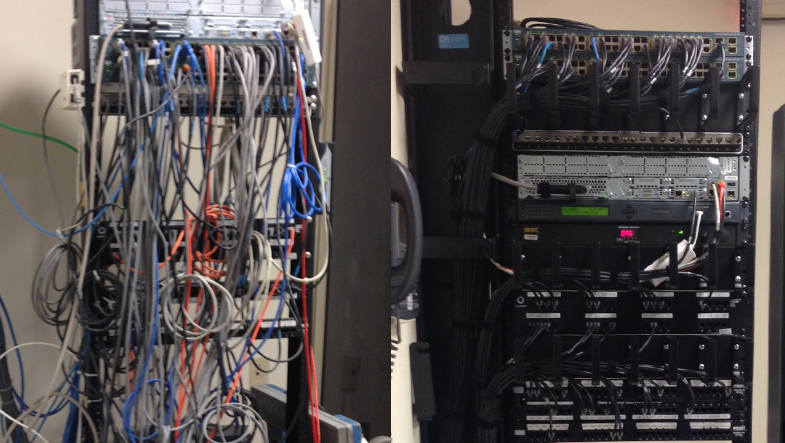 As part of a multi-year project, Cabling Systems is helping to upgrade network equipment and rewire all of the bank’s branches: 250 branches in the Washington, D.C., area and 900 nationally. In the evenings, Cabling Systems technicians rewire branches with new category 6 cabling. On the weekends, they replace the network equipment and computers and patch everything in, coordinating with the bank’s national IT department and help desk to let them know when the system is shut down and when it’s patched in and ready for final testing. By Monday morning, the branch opens with new computers on the desks and access to the new high-speed computer programs. Another project involves installing cameras, both for security and to track customer behavior. An infrared video system designed to improve customer service counts the customers who enter the branch and tracks their movements throughout the branch, recording what customers do, which associates help them the most quickly, and the like. Cabling Systems also installs cash counting machines to count money so that tellers never need to touch cash. “These machines will count money like a glorified ATM, saving tellers hours each morning and night and avoiding mistakes,” said Narron. In addition to the quality of its work, one area in which Cabling Systems shines is its trustworthiness and attention to detail. “We work hard to keep up the client’s standards and adhere to their code of conduct,” Narron said. “We remember we’re in the back office of a bank branch in the middle of the night.” That means not only managing the security aspects of getting access to a branch and locking up when the work is done, but also showing extensive attention to detail. For example, Cabling Systems professionals make sure that everything down to the client’s placement of their personal desktop items is exactly the same the next morning as it was the night before. This focus on precision makes it easier for branch employees to move right into their workday without disruption. It also demonstrates the seriousness and care with which the security aspects are considered and the work is done, highlighting why Cabling Systems, Inc. is a firm that can be trusted to do the job right. To learn more about Electrical Alliance contractors, search our database.